During the early and middle 1950s, voice actor Daws Butler (Chilly Willy, Reddy) created a sort of laconic drawl, which he used for the "Wolf" character in several of MGM's "Droopy"
cartoons. Later, he used the same voice at Walter Lantz Studios, for Smedley the Bear (a foe of Chilly Willy) and other characters. In 1958, he gave that voice to a syndicated TV character called Huckleberry Hound, and that's what it's mostly remembered for today. Huckleberry Hound was Hanna-Barbera's second animated TV series, and the first in which they produced and controlled the entire content of the entire show. Its three cartoon segments — the other two were Yogi Bear and Pixie & Dixie — were all Hanna-Barbera productions, and its host — Huck himself, a laid-back guy with a Southern accent to go with his countrified name — also belonged to them. A total of 55 episodes were made. Among Huck's many distinctions is his show's Emmy Award, which it won during the 1959-60 season, and which was the first ever given to an animated series. In 1961, Yogi Bear was spun off into a show of his own, and replaced by a new character named Hokey Wolf. Huck made the transition to comic books in 1959, when, like most of his contemporary cartoon stars, he was picked up by Dell Comics. Despite a couple of changes of publisher (first to Western Printing's Gold Key imprint, then to Charlton Comics), he was published regularly in that medium until 1972. Since then, he's appeared sporadically in comics published by Marvel, Harvey, Archie, and DC. He was also, like most Hanna-Barbera stars, merchandised all over the place. Back in TV, Huck didn't exactly disappear. He was in several ensemble shows, such as Yogi's Gang (1973), which he shared with Peter Potamus, Wally Gator and others; and Scooby's All-Star Laff-A-Lympics (1977), where other players included Augie Doggie and Snagglepuss. 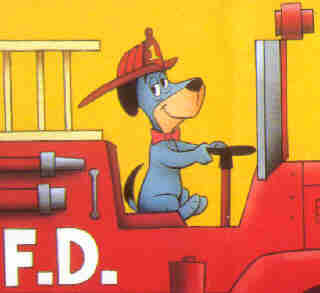 He also turned up in the occasional feature or special, including Yogi's First Christmas (1980) and The Good, the Bad & Huckleberry Hound (1988). Huck is no longer one of Hanna-Barbera's superstars, but his videos sell steadily, if not spectacularly, and he can still be seen at odd hours on TV. Text ©2000-06 Donald D. Markstein. Art © Hanna-Barbera.